This Foothills Trail Conservancy outing included a boat ride, an invigorating hike, and swimming in Lake Jocassee! A group of nine FTC members and their guests had a near perfect day to enjoy a trifecta on, around, and in Lake Jocassee on September 1st. 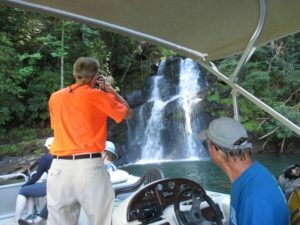 First, the group was taken to a cove near Rock Creek and dropped off by Boat Captain and FTC Board member, Brooks Wade of Jocassee Lake Tours and Shuttle Service. 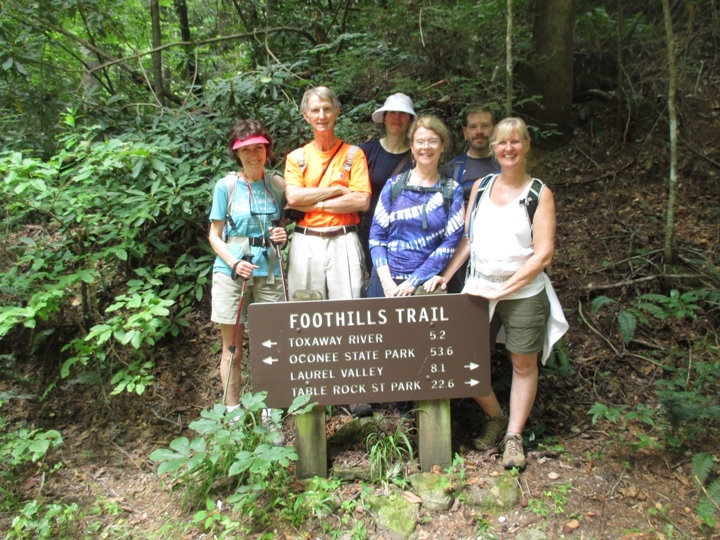 Heyward Douglass, FTC Executive Director, then led the group on a hike of almost 5 miles along the Foothills Trail. At the Laurel Fork boat access, Brooks picked up the hikers and took them to a swimming hole to cool off, and then followed that up with a leisurely waterfall tour on the way back to Devils Fork State Park. A truly great outing! !